My challenge with Andrew Thornton’s November Reader’s kit wasn’t the fact that nearly every component in the set was yellow, a color I have little design experience with. My biggest challenge stemmed from the luxury seed bead mix dominated by sparkling yellows, pale greens, peaches and a punch of gold and bronze. They begged to be spilled out on my mat and stitched into something lovely, organic and freeform. But I promised myself I would complete this project sans needle. My favorite pieces in the Jonquil kit were the knowledge tree pendant (the month’s mystery component), and the long wooden bead, both of which cried out to be used in a focal. 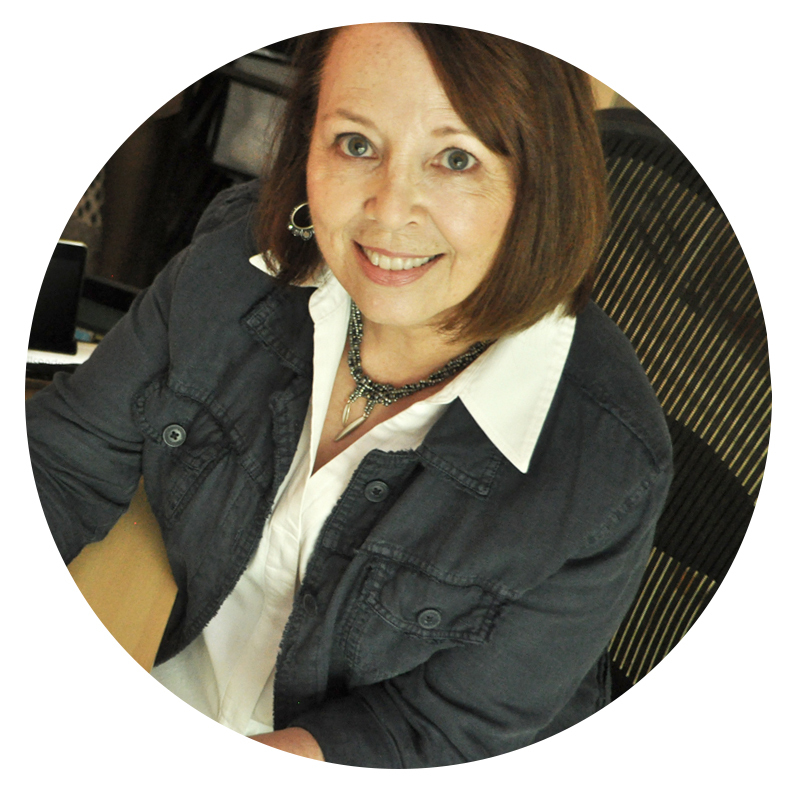 With kit in hand, I was off to my favorite bead store, where I found a carved, black onyx leaf, which brought out the color and detail in both. To heighten the challenge, I threw pink into the mix, another color that rarely makes an appearance on my bead table. 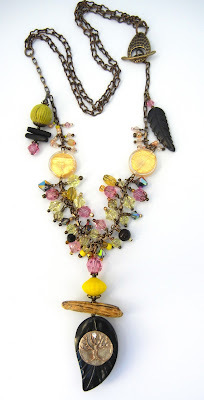 Once my focal was secured to the brass chain supplied in the kit, I dusted off my wireworking skills, creating sections of dangles leading to some gold Venetian glass coins from my stash. I used the soft peach tones from the kit to transition to the larger dangles that echo the focal. To give more length to the necklace, I added a doubled length of Vintaj ornate chain. Lovely piece! The onyx black leaf really looks great. 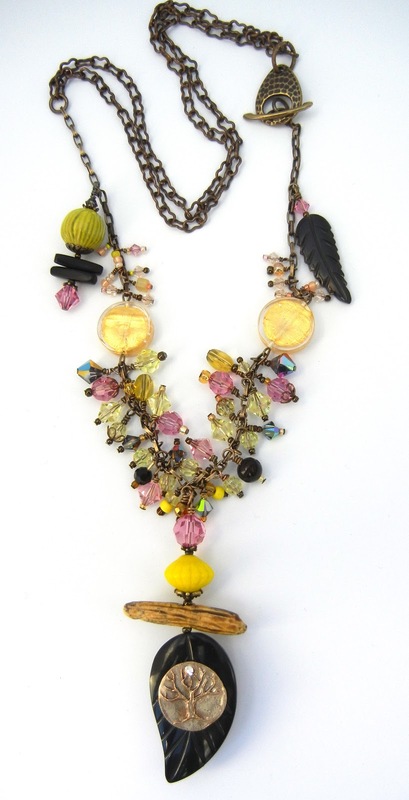 Fine necklace.Very interesting as concerning the beads used and as a composition of nice,sunny and optimistic colors. I love your necklace it is very pretty. I like that you chose to use pink it makes the yellow pop! I love the pink and the onyx leaf with Andrew's tree. Wonderful! Beautiful work! I love what you added to the challenge pieces. It has so much color and movement. Oh my! This is seriously one of my favorites! I love the layered look of the pendant. The dark tone really frames Andrew's special component so well! And adding pink - both colors would give me troubles - really plays up both colors in such a playful way. Very nicely done! And I love that you challenged yourself further to do techniques that you don't normally do. You hit this one out of the park! I like the addition of pink and black with the yellow kit. It has a "happy" vibe! Lush and pretty and light and feminine. I think this is my favorite piece in the hop. Looks just perfect to me!